At NYC Smile Design we have never been big proponents of over the counter mouthwashes since they contain alcohol as their main ingredient. There is as much as 26% alcohol content which equates to a 52 proof alcoholic drink. Most people drink wine and beer as their alcoholic drink of choice and they rarely reach alcohol content of 14% and no one keeps their drink in their mouth for 1 minute or more before swallowing it. Herein lays the problem with mouthwashes with high alcohol content that are in contact with the mouth for long periods of time before spitting them out. In a recent finding that was published in the Dental Journal of Australia they showed that these mouthwashes are dangerous and a risk factor linked to the development of oral cancer. Long term use has shown microscopic and macroscopic changes to the tissues. If you’re a smoker the effects are magnified because studies have shown that alcohol enhances the penetration of tobacco associated carcinogens. 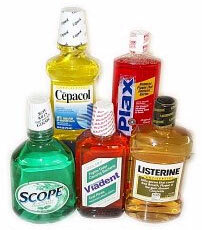 Most people use these products to eliminate bad breath and with smokers this can be deadly. In another study researchers found that these mouthwashes are quite acidic anywhere from 4.3 to 5.0 and cause erosion of dental enamel and can eventually cause sensitivity of the teeth. Neutral ph is 7.0 similar to the ph of saliva. This means these mouthrinses are quite acidic. If your enamel is thin or thinning chance of getting tooth sensitivity increases with the use of these mouthwashes. People tend to assume if a product appears in the supermarket shelves it must be safe. Time and again that assumption has proven incorrect.